On Friday the 17th November 2017, the staff and pupils took part in raising money for Children in need. 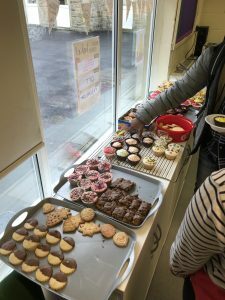 Structured activities designed to inspire the children to use their own ideas in preparing and displaying cakes and biscuits to sell during a coffee morning. A he amount of biscuits were baked and decorated, the pupils took ownership of their own creations as they were given the option of ten different recipes. Pupils gathered at break times to show one another their creations, contributions towards the charity were also taken for the cakes. Also the children opted to do a “wear anything” day, were donations were collected at the door upon arrival to school. Pupils also took part in activities throughout the day that supported the charity Children in Need, towards the end of the day staff encouraged children to embark in a colouring competition, In which baby grows were used and children were asked to create a baby grow that summarised their own interpretation of what “Children in need” represented. Numerous baby grows were created, and at the end of a day a winner was picked from each key stage. The day was thoroughly enjoyable for both staff and pupils, and a total of £56 was raised throughout the duration of the day.